I call Matt Albert at Yachting Partners International about the recent price cut to Lurssen's 40.35m superyacht Leonora and he tells me that, having had a recent £3 million pound refit, the new price means a buyer would effectively be picking up this refit for free. Delivered in 1991, the superyacht's wood-panelled interior offers accommodation for eight guests in a master, VIP and two twins. 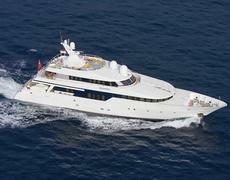 Formerly offered at €9.9 million, she's now asking €7 million. Leonora is listed at boatinternational.com.